Day 2 of the Dutch trip, saw Dave & I returning to Drents-Friese Wold National Park soon after dawn. After some dawn drizzle, the weather picked up & the sun finally came out. Our friends from the night before were still around. Parties of Crossbills were flying over the clearing & small lake we were standing by, but none were arriving to drink from the lake. Whilst some of the calls sounded similar to my local Dorset Crossbills, other calls were clearly different with deeper notes. But not being familiar with the calls of the local Dutch Crossbills & presumably some visiting Crossbills that would have arrived with the Parrot Crossbills invasion, trying to figure out the Crossbills identification based upon calls was just too difficult to claim Parrot Crossbills in flight. Speaking to some Dutch birders, the Crossbill parties tended to drink around lunchtime. Eventually a large mixed Crossbill party flew over & landed in scattered trees in the clearing. Scoping them up we could see both Parrot Crossbills & Crossbills in the group. A closer approach allowed better views & a few grainy photos to be taken. They were feeding by ripping off small pine cones & then flying back to the tops of the pines to feed. As the party of 50+ Crossbills flew off, we could hear the deeper calls of the Parrot Crossbills along with the more familiar Crossbill calls. There were at least 15 of each species in the flock, but having spent most of my time watching through the camera lens, it was difficult to be more certain of numbers. Unfortunately, no sight or sound of any Black Woodpeckers, but we did have a Lesser Spotted Woodpecker flying across the clearing. Also seen were several hundred Tundra Bean Geese flying off to feed in local crop fields from their local roost sites. The plan for the rest of the day was to look for more Geese. The first stop was to see some Barnacle Geese we had seen the previous evening by the bar in Diever. The next stop was the floodplain to the South West of Zwolle. The final stop was Oudeland van Strijen. This was an excellent reserve where recently there have been about 7000 White-fronted Geese, along with up to 30 Lesser White-fronted Geese as well as large numbers of Barnacle and Greylag Geese. Due to the previous stops, we were running short of time & light at Strijen & didn't have enough time to look at no more than a small percentage of the Geese present. There were no Lesser White-fronts in the Geese flocks we checked. Finally, we had to head back to the Eurotunnel. We knew we were going to miss our train, but the ticket allows you to catch the first train with spare places: this was the next train so only a 15 minute delay. I had contemplated a day trip, but door to door was 1050 miles. I figured that distance would be better to do over 2 days & the extra day would allow more time for enjoying the birding & trying to see a bit more of the country. Overall, it was a great trip, the Dutch people we spoke to, were all very friendly, helpful & spoke good English (as not surprisingly we didn't know more than a word or two of Dutch). Even discussing the bird names didn't take long to ensure we were talking about the same species. The best bird name we discussed was the Night-Swallow (the direct translation from the Dutch): a far more evocative name than the English Nightjar. The trip has fired me to return again in the next year or two for a longer visit. Been a long & tiring day as I didn't manage to get much sleep last night for reasons I'll explain later. However, the birding has been interesting today & I did manage to get some close up photos of an Owl. So pleased by that. As it was very approachable I thought I would start with this nice cropped shot. Been a bit of a rush job to get some photos published this evening, before heading out to eat, so I'm sure I will find some better photos when I get the chance to view all the photos. I'm sure those of you not in the know, are thinking, yeah, yeah I've seen better photos of Little Owl on Brett's blog, so here is the original uncropped photo. taker for a lift: Dave Gibbs, who is helpfully pointing out the bird in the photo. Here are a few more details to wet the appetite for anybody considering a Eurotunnel trip for this weekend. Our return trip for car & passengers a mere £53 return. After an easy drive of about 4.5 hours, we arrived at the town of Zwolle. Turning off a main road, in the Southern side, we entered the side streets & into a trading estate, where the crowd were quickly located. The bird was catching small rodents in a building site that was being cleared. It was sitting quite unconcerned of the people watching it or the yellow digger demolishing the foundations of a nearby building. Can't resist some more photos of this excellent Owl, which I can remember wanting to see ever since I started looking at my Heinzel, Fitter & Parslow Birds of Britain & Europe guide in the early 70s. Not having been to Scandinavia then this was a World tick. All memorable twitches should have a crowd photo. So about 2/3rds of the midday day 4 crowd. After a quick refrshment trip, it was onto Drents-Friese Wold, a national park, about 45 minutes to the North of Zwolle. This area looked similar to some of the heathland/woodland sites in North Hampshire & was currently hosting about 30 or so Parrot Crossbills along with a few resident Black & Lesser Spotted Woodpeckers. Large flocks of Tundra Bean Geese arrive in late afternoon to roost. There was no sign of any Crossbill flocks in the late afternoon. We had the place to ourselves except for these locals. Found a good & inexpensive hotel in the nearby small town of Diever. An early morning visit to Middlebere following a sighting of a Great White Egret, but sounds like it was just a fly over bird. Still a rare visitor to Poole Harbour & as they never stick for more than a few minutes, it's still a much awaited harbour tick for me. But the tide was just perfect for the main hide. It's one of the last places in the harbour to flood & the water levels were not too high to stop a large flock of over 800 Black-tailed Godwits & 270+ Avocets from roosting or feeding in front of the hide &occasionally getting spooked by the local Peregrine & Marsh Harrier. As the water started to slowly drop & the Avocets started to move around, I could see at least 8 were colour ringed, including 2 or 3 birds with a single large ring with 3 bands of colours on one leg & 2 rings on the other leg. But frustratingly, the bulk of the Avocets were still roosting & only standing on one leg. Unless you can see both legs you can't confirm the individual. I'm still waiting for confirmation as to where the Avocets were from, but sounds like 2 were French birds & another 2 were British ringed. Another visitor from outside Dorset was this Spotted Redshank, but I'm not sure where the Poole Harbour wintering birds are from. Keeping a close eye out for a weak bird was this Yellow-legged Gull. I saw one successfully kill a Teal here last year & they regularly spook the Waders & Wildfowl: which I've yet to see the local Herring Gulls do. This is almost certainly a European bird from the near continent, but just possibly a local bird as a single pair have bred locally in Poole Harbour in recent years. There are usually one or two birds hanging around in the Autumn &Winter at Middlebere, but more appear close to dusk to roost especially in the Autumn. Finally, this Green Woodpecker is probably a local bird. It's not unusual to see 2 or 3 Great Spotted Woodpeckers migrating in the Autumn in a morning at my Studland visible migration site, but I've yet to see a Green Woodpecker migrating there, so I'm assuming the Dorset birds are fairly static. It's not unusual to see Butterflies on the mild, sunny days in November locally. What is more unusual is seeing 3 different species on the wing. Still it brightened up an otherwise quiet walk out to Old Harry. First seen was the expected Red Admiral. At least 2 of these regular late Autumn species were on the wing in the sun. They overwinter as adults and can occasionally be seen on the wing on warm, sunny days in the winter. The earliest Butterfly I've seen in the UK was a Red Admiral on the wing in Poole Harbour on the 11th Jan 2013. Another species that overwinters in the UK as an adult, but in smaller numbers, is this Peacock. The biggest treat was seeing 2 Clouded Yellows also flying along the field leading to Old Harry. This is an immigrant Butterfly which appears in varying numbers from Southern Europe and in good years (like this year) can be seen well into the Autumn & is one of my favourite British Butterflies. They won't overwinter as adults in the UK, but with the numbers present this Autumn, we will hopefully see them locally bred adults next Spring & Summer. After the Diver party, it was back to regular birding. With the sunny & still weather, conditions were great for looking for birds along the bushes behind Studland's Southern beaches. 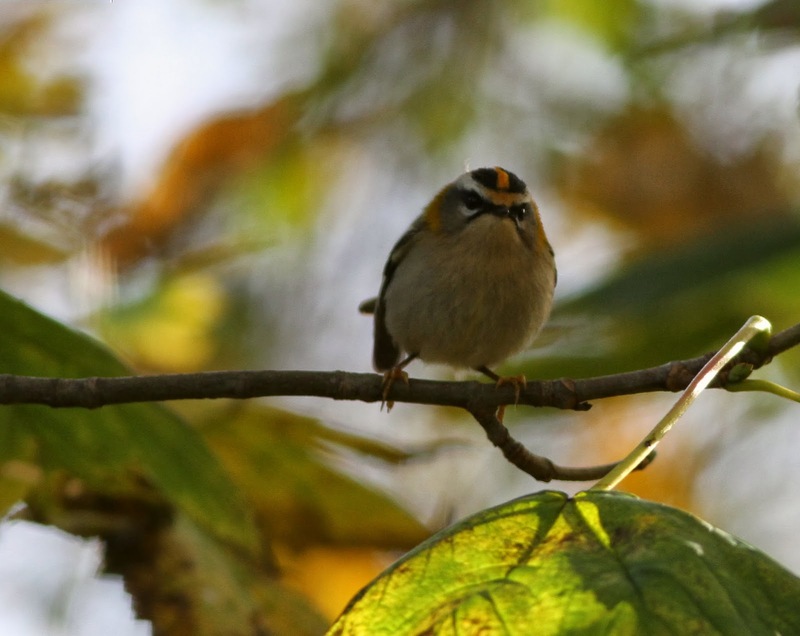 The highlight was this cracking Firecrest. This is favourite of most UK birders, given they are so well marked compared to their commoner cousin, the Goldcrest (see Mystery Bird Photo). They are also even more hyper as they move around feeding. 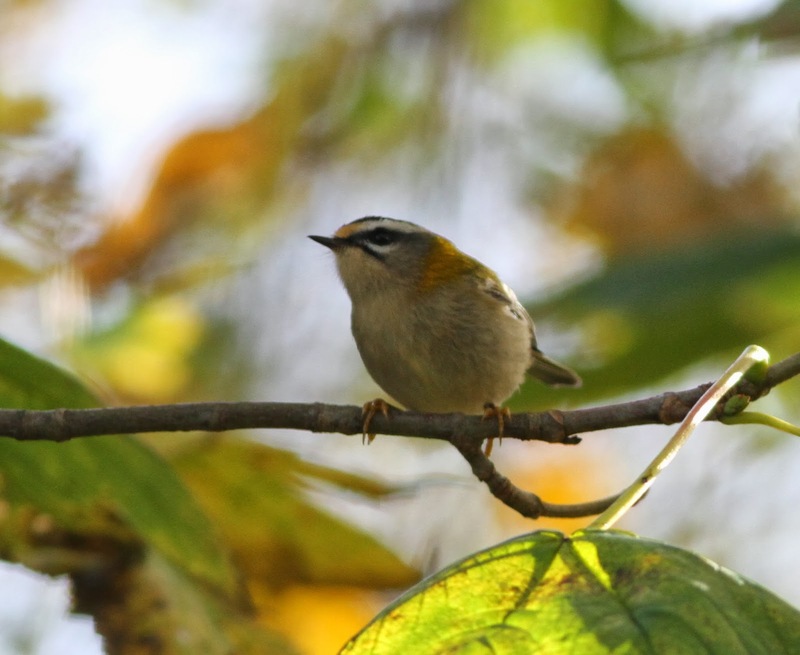 Studland usually has a few Firecrests overwintering in regular spots. Next stop was Knoll & Middle Beaches. 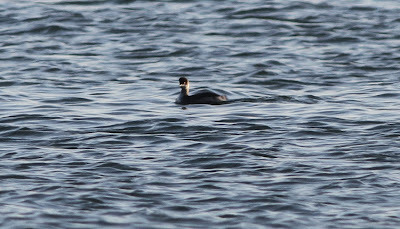 Studland is the most important wintering grounds for Black-necked Grebes in the UK. Currently, the numbers are still building up with their peak in January. In January 2011, Steve Morrison counted an 80 roosting together (along with several Slavonian Grebes). Most feed in the eel grass off Knoll, Middle & South beaches, but a few can often be found closer to the harbour mouth & in Brands Bay. Today, 29 of the 33 birds were off Knoll & Middle Beaches. normally, by late morning, they are well dispersed in small parties throughout the bay, so it was a pleasant surprise to find 26 in a single tight flock. Keeping to the monochrome theme, this cracking Gull flew in & landed on the beach. About 10 years ago, Graham Armstrong had a flock of 5 of these birds on the beach which was an impressive total for Studland. 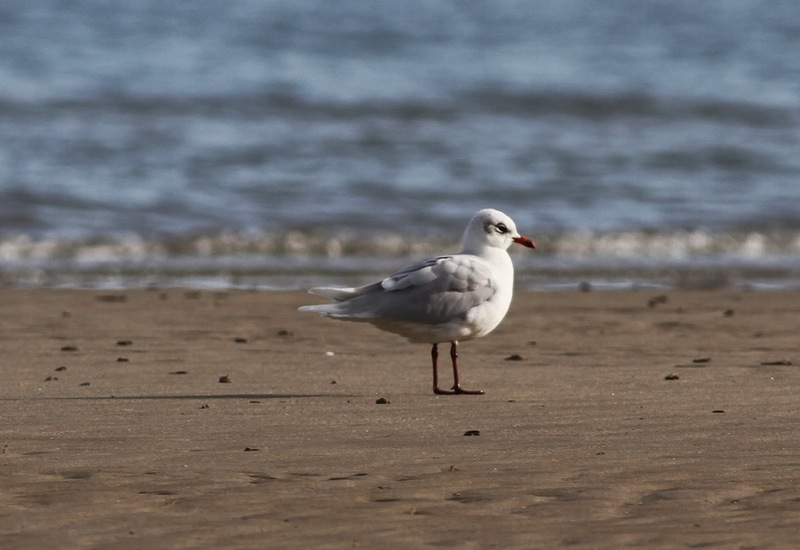 Last March, I had a conservative count of 350 birds on the beach. 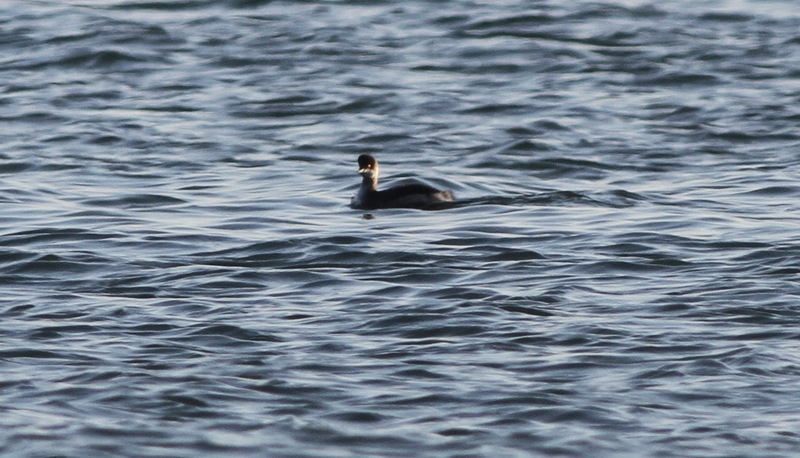 Here is a closer photo of a Black-necked Grebe off Pilots Point a few days later. 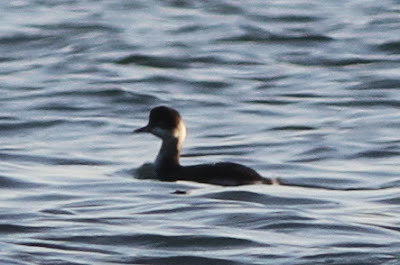 To me, they always look like large Dabchick's rather than a Slavonian Grebe. Best told from Slavs by the high forehead, black extending in a curved patch below the red eye and the rounded rear end to the body. They are also smaller, with a more rounded, short body, thinner neck & thinner, more feeble bill (albeit these are more subtle features). In contrast, Slavs have a gently sloping head peaking well behind the eye, with have a much whiter face with the black in a straight border not extended below the eye and a more elongated rear end to the body. No prizes for identifying this as a Mediterranean Gull. Colour ring studies have shown that some of these wintering birds originate from colonies in Holland, Belgium & France, although some will be birds that have bred locally in Poole Harbour.